January 13, 2015 By This post may contain affiliate links. Whenever I make food for the sports fans in my life, I can’t go wrong if I include bacon, cheese, and beer in the recipe. Last year, I served some Bacon Cheddar Beer Bread Footballs, and they were a huge hit, so I thought it would be fun to play around with some other recipes using the same flavor combination and came up with this Beer Bacon Cheese Dip. Of course, you know I can’t just throw a dip in a bowl and serve it. I just can’t. I have to make it look festive. I found a really cool serving vessel that has three small football shaped bowls attached together with a goal post in the middle. It is the absolute perfect size for my cheese dip. One batch was divided in thirds. I served one bowl of the plain dip, another was spiced with hot sauce and the final one was spiced with jalapenos. 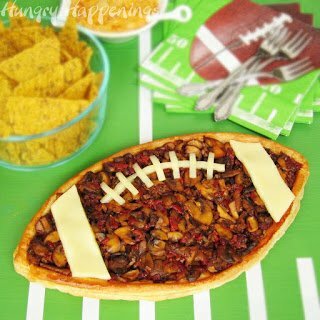 I topped each bowl with crisp bacon and decorated each with slices of white cheddar cheese to resemble the stripes and laces on the footballs. 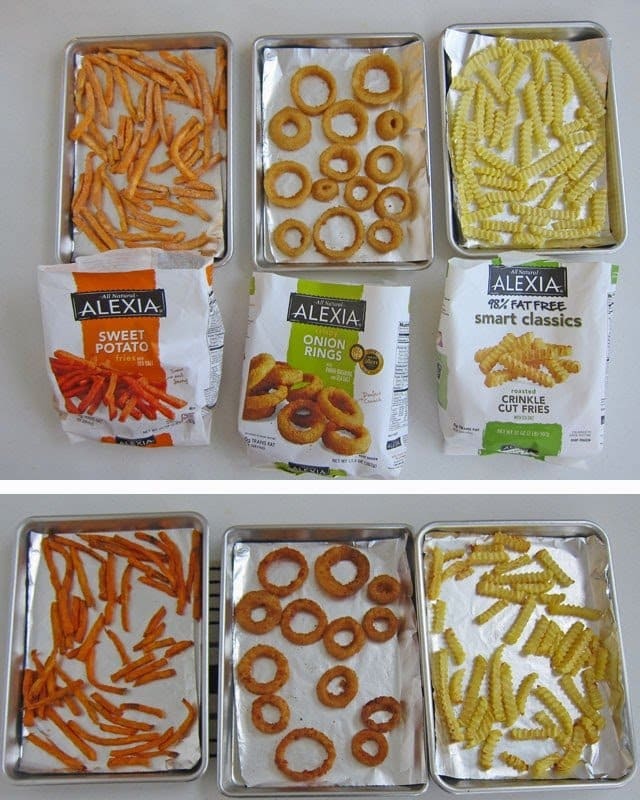 Of course I needed something to serve with the dip and chose fries, but not just any fries, Alexia Fries. I always have them in my freezer. I love the Sweet Potato Fries, my husband prefers the Crinkle Cuts which tasted great covered in the cheese dip. 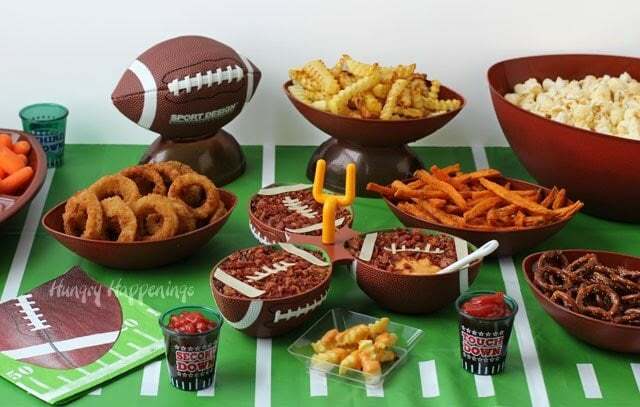 I baked the fries along with some Alexia Onion Rings, and served them in football shaped bowls too. I found a great selection of frozen Alexia products in the side dish freezer section at Walmart. I had never tried their onion rings before and really enjoyed the crisp exterior and nice fresh onion flavor. The sweet potato fries will always be my favorite, but I enjoyed trying some new varieties. To set up my game day buffet was super easy. I simply used a plastic game day tablecloth and football shaped or themed serving dishes. 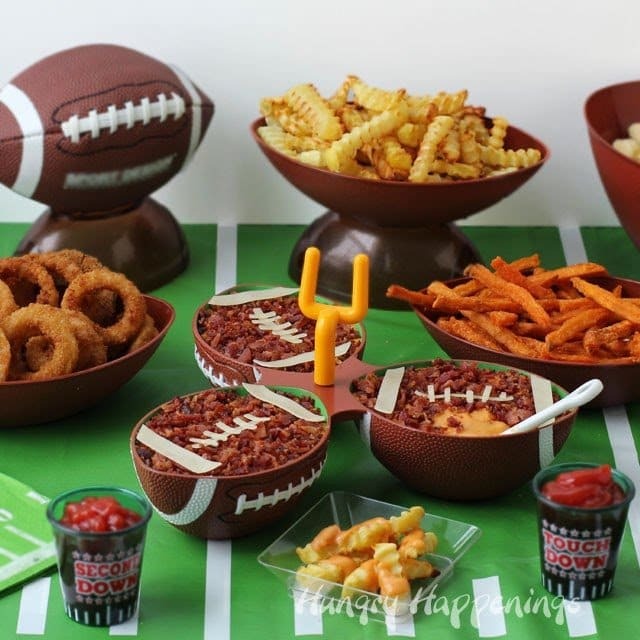 If you have all this stuff on hand, and your friends decide at the last minute to stop by and watch the game, you can make a super impressive looking party buffet in no time. Chop bacon into small pieces. Cook bacon in two batches in a medium saucepan set over medium heat. Remove bacon and measure the bacon fat. You need 3 tablespoons. If you have too much, remove some, if not enough add butter to make up the difference. Place bacon fat back in saucepan and heat over medium heat. Add flour and stir for one minute, scraping up all the browned bits on the bottom of the pan. Slowly pour in beer whisking until thickened. 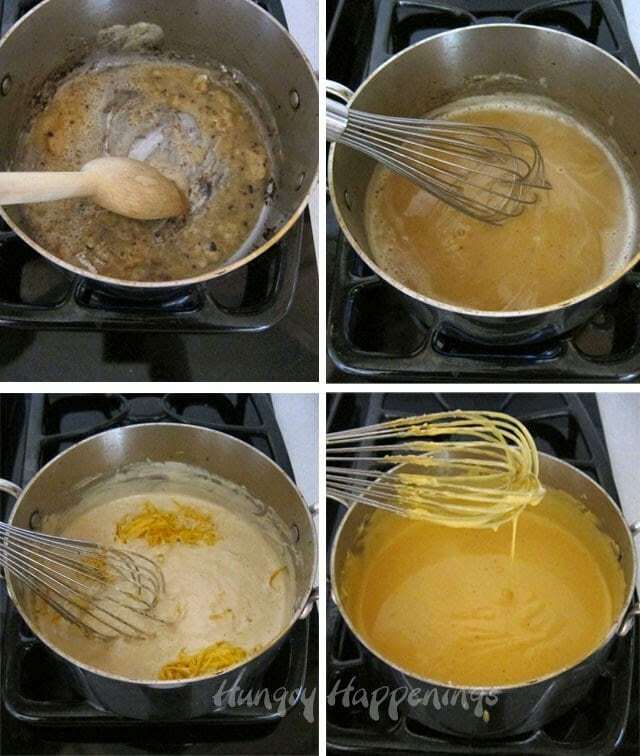 Add heavy whipping cream, then mustard and stir to combine. 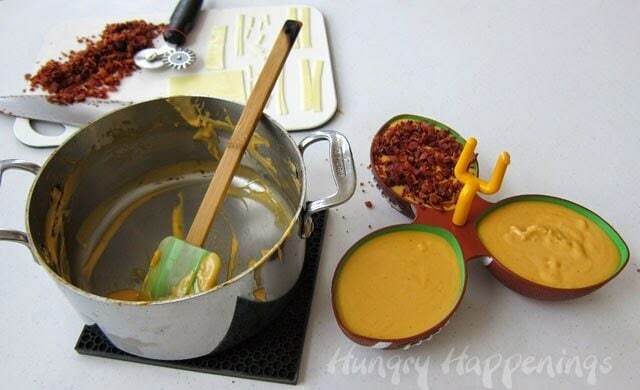 Reduce the heat to low and add one handful of cheese at a time, stirring until completely melted. This took me about 15 minutes. Don’t rush it or your dip can curdle. You want it nice and smooth. Season with salt and optionally any hot sauce, or pepper. 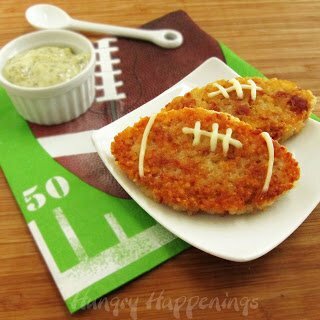 Pour the cheese sauce into a football shaped bowl or in my case, a football dipping dish with three individual plastic football shaped bowls. I love this set of bowls, not only does it look cool, but I was able to fill each bowl with a different flavored beer bacon cheese dip. One was plain, one had hot sauce and another jalapenos. Finely chop the bacon and sprinkle it over the cheese dip. Cut white cheddar cheese slices into strips and laces to turn each dip into a football. Set the cheese pieces over the bacon. with a variety of Alexia Fries and Onion Rings. We have a small toaster oven, and we filled plates with the baked fries, scooped some of the Beer Bacon Cheese Dip on top and heated them through before digging in. This shop has been compensated by Collective Bias, Inc. and its advertiser. I am a huge fan of Alexia products and keep them in my freezer all the time, so I am very happy to share this idea with you. #GameTimeGrub #CollectiveBias. 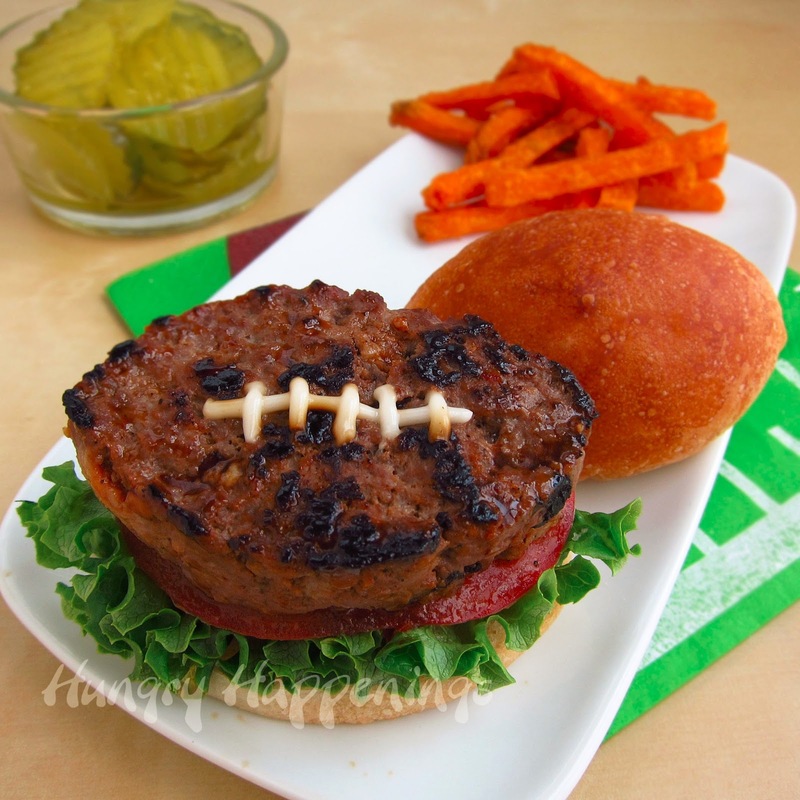 Follow Alexia on Facebook or Pinterest.What do your hungry fans like on game day? What are some of your favorite recipes? Thanks so much, Heather. 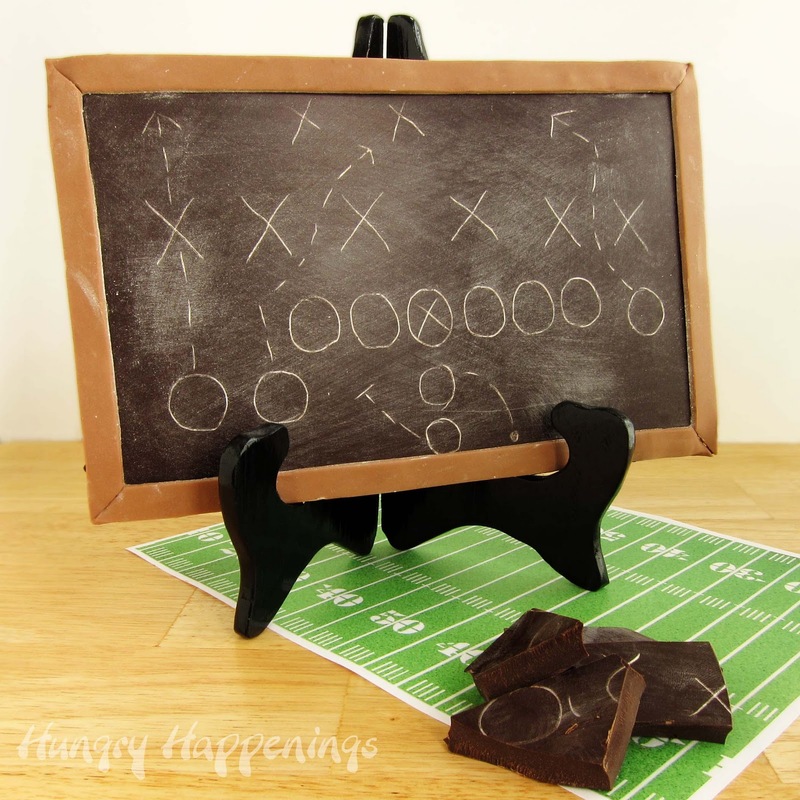 It is a fun way to serve a dip for a Super Bowl party. Not only do I think that recipe sounds amazing, I absolutely LOVE all of your football dishes! Thanks, I love those dip dishes too! Not only do I think that recipe sounds amazing, I love all of your football dishes! That is quite the spread! Looks like your guests are going to very happy. Thanks, my friends did really enjoy all the fun snacks. 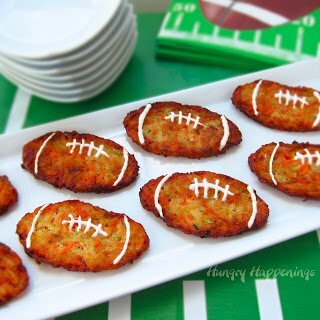 Love all your recipes and can't wait to try them for Sunday's Game!! Thanks, Diane, I hope you have fun making some of them. Enjoy!